We often like to take a retrospective look at our trades, by doing so, we can take this information and use it to help us become better traders moving forward. Analyzing past trades, for better or worse, is a must for any trader if they truly wish to improve their future performance. 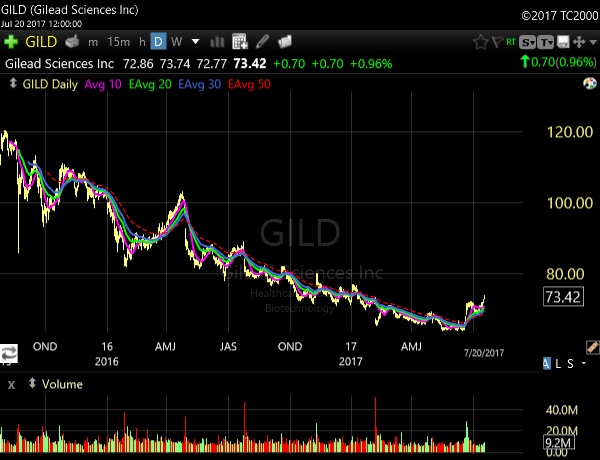 Today however, we will fast forward a bit and take a look at an open trade we have in Gilead Sciences (GILD) as it provides a good example of what we look for in possible Trend Reversal trades. As always, we want to focus our attention on the market sectors that are exhibiting the most strength. Healthcare stocks have been hot and one of those groups within the sector, biotechnology, has been charging up the leaderboard over the last six weeks. 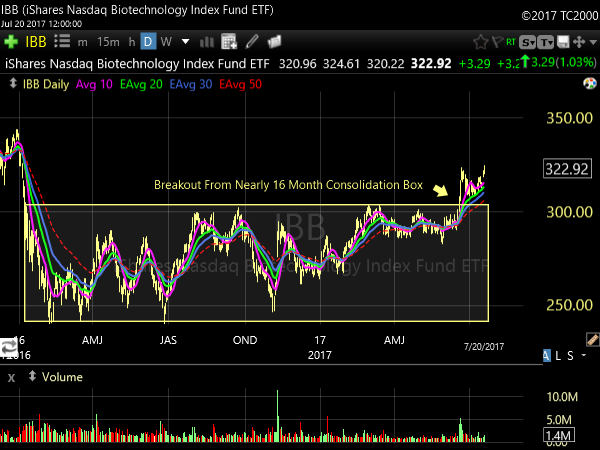 The Index Fund IBB tracks biotechnology performance and is heavily weighted toward big cap names in the sector. As we can see in the daily chart below, this fund has recently broken out of a long consolidation that lasted nearly 16 months. 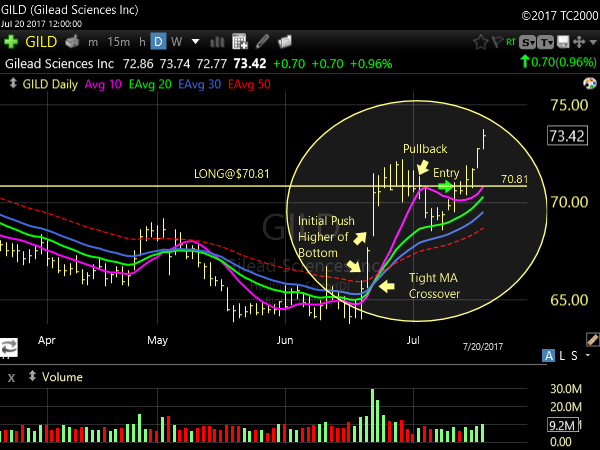 After identifying this top performing group, we continued to scan the charts daily for possible set ups. As with any hot group, there were several stocks hitting our scans that kept catching our attention and GILD was one of them. First, lets take a look at a two year daily chart that shows a persistent sell off in Gilead shares. After all, we can’t have a Trend Reversal trade unless there is an established trend in place and this one was a doozy, as GILD lost nearly 50% over the time frame. However, as we zoom in on the chart below, the stock begins to wake up on 6/20 with a decent advance on above average volume. This began a three day charge that netted nearly 12% in gains. This initial thrust higher was our first sign that a change in character may be taking place. A second confirmation was the tight crossover of the 10 day simple, 20 day exponential and 30 day exponential moving averages. We will often see this as selling pressure starts to wane during bottoming processes, in this case it did so very quickly as a result of the quick surge in price. Our next move was to wait for a pullback. For our purposes, we need a minimum one bar pullback which consists of a lower high and a lower low. We will keep a stock on the set up radar for up to about 11 days on its pullback, after that we may consider the current set up failed, however, we will not take it off our watch list, as it may set up as more of a breakout type pattern later. We got the pullback we were looking for on 7/5 and it ultimately lasted for five days, at this point we started to zero in on our trigger price should the shares start to resume their advance. Several factors are taken into account to decide where that price trigger will be. Some of those factors are the depth of the pullback, resistance lines, accompanying volume on the ensuing advance etcetera. There is really no formula for an exact entry but the over riding factor is that we want to be as sure as we can be that the pullback is over and the next advance has begun. As you gain more and more trading experience you will be able to get a better feel for this. As we looked at the chart we felt that if the stock cleared some prior support and resistance near $70.85 that the next move up had some legs, so this price acted as our trigger point. Shares did ultimately start to move higher and our trigger was hit on 7/13 and we went long getting filled at $70.81. It remains to be seen if our GILD trade turns out to be a winner but we are off to a good start as we are up nearly 4% six days into the trade. The two other major, if not most important components of this or any other trade, are your stop loss and your profit target which we cover in detail here with each trade we initiate.